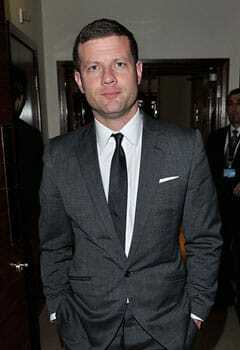 Dermot O’Leary is best known for his roles on The X-Factor and BBC Radio 2 . His television debut came in 1998 as one of the original presenters on Channel 4’s weekend slot T4 . In 2001 he then began presenting Big Brother’s Little Brother the sister show to reality programme Big Brother. In 2007 it was announced that Dermot would replace Kate Thornton as the presenter of The X-Factor . He took a one year break from the show in 2015, but due to popular demand was back in 2016. Also, Other shows Dermot has presented in his career include The National Television Awards , BRIT Awards and Children in Need . An accomplished radio host, Dermot has kept listeners entertained on BBC Radio 2 since 2004. 1998 - Makes his radio DJ on BBC Essex . 1998 - Starts hosting T4 . 2001 - Begins presenting Big Brother's Little Brother . 2004 - Joins BBC Radio 2 . 2007 - Replaces Kate Thornton as the host of The X-Factor . 2010 - Starts presenting The National Television Awards . 2015 - Leaves The X-Factor but returns one year later. 2017 - Hosts the BRIT Awards for the first time. Dermot O’Leary can be found presenting some of the biggest radio and television programmes in the UK, regularly delighting millions of people. After graduating from university with a degree in media and politics he joined his local radio station, BBC Essex , as a DJ . His on-air charisma made him an instant hit with audiences and it wasn’t long until he made the transition to television. Perfectly for their teen demographic, Dermot began hosting new show T4 in 1998 and he remained on the programme until 2001 when he joined Big Brother’s Little Brother . On this show, Dermot’s likeable personality was able to shine, as the programme regularly involved a variety of fun games for guests to get involved with. Continuing his radio work whilst establishing himself as one of the most popular tv presenters, after a stint on XFM he joined BBC Radio 2 in 2004. He currently presents Saturday Breakfast with Dermot delighting listeners with a mixture of music, chat and interviews. In 2007, Dermot replaced Kate Thornton as the host on one of the biggest shows in the country, The X-Factor . During his time on the show he saw some of the world’s biggest stars emerge including Olly Murs, Little Mix and One Direction. In 2015 he left the show to pursue other ventures but due to popular demand, returned just a year later and continues to dominate Saturday night television. As well as The X-Factor , in 2010 Dermot was tasked with hosting The National Television Awards . The biggest night in UK television, the awards see stars from all genres come together for an evening of celebration. Accomplished at negotiating live television presenting, he has also hosted live telethons including Sport Relief and Children in Need . In 2017 he presented the 37th BRIT Awards and continues to appear many of the UK ’s biggest shows. As one of the country’s most popular presenters, Dermot O’Leary has a huge fan base. This invariably provides a boost to every brand he aligns himself with and he has provided voiceover for campaigns with Mullerlight and has also worked with Marks & Spencer , British GQ and fashion brand The Idle Man .